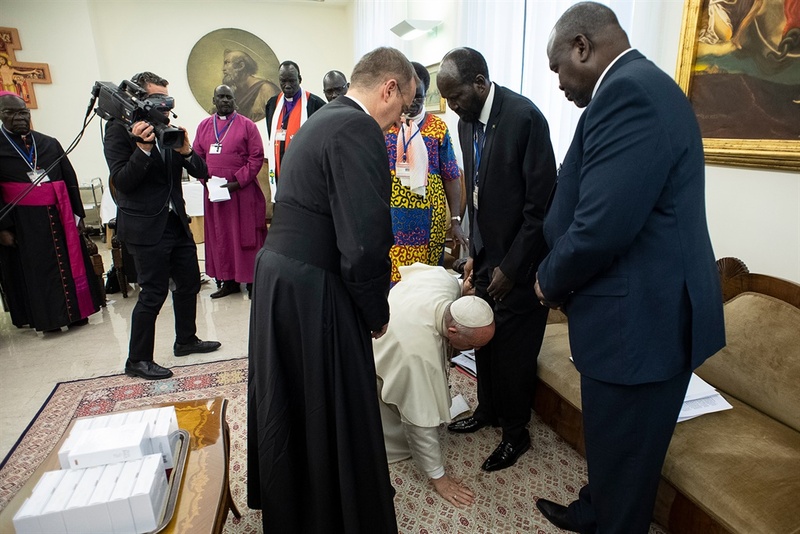 At the close a two-day retreat in the Vatican for the African leaders, the pope asked South Sudan's president and opposition leader to proceed with the peace agreement despite growing difficulties. Then he got down on his knees and kissed the leaders' feet one by one. "I express my heartfelt hope that hostilities will finally cease, that the armistice will be respected, that political and ethnic divisions will be surmounted, and that there will be a lasting peace for the common good of all those citizens who dream of beginning to build the nation," the pope said of South Sudan in his closing statement. The spiritual retreat brought together President Salva Kiir and opposition head Riek Machar. Also present were Kiir's three vice-presidents. The pope kissed the feet of all of them. The South Sudanese leaders did not make any statement in response to the pope's plea for peace. The two-day Vatican meeting was held a month before the end of the shaky peace deal's pre-transitional period. On May 12th, opposition leader Machar is expected to return to South Sudan and once again serve as Kiir's deputy.